PA terrorists are competing to claim credit for a second attack on Route 60 near Jerusalem. One of the victims was the brother of Emanuel Moreno. Palestinian Authority terrorist groups are scrambling to claim credit for a second attack that left a Jewish man and woman, both in their 30s, wounded on a road north of Jerusalem late Wednesday night. Rabbi Moshe and Shira Moreno, residents of the Jordan Rift Valley, were treated on the scene by Magen David Adom medics before being rushed to Hadassah Ein Kerem Medical Center in Jerusalem. Moreno was moderately wounded, and suffered leg injuries; his wife sustained lighter wounds as a result of the vehicle overturning. 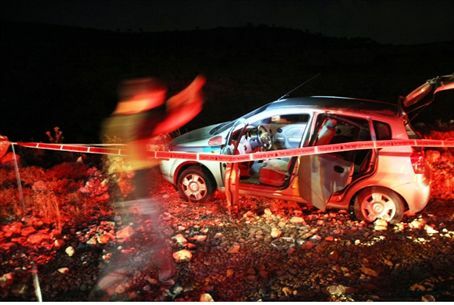 Terrorists peppered their car with bullets in a drive-by shooting on Route 60 between the Rimonim Junction and the Jewish community of Kochav HaShachar in the Binyamin region of Samaria, just about 15 minutes north of the capital, at about 11:00 p.m. The vehicle overturned, tumbled down an incline and landed in a ditch. Rabbi Moreno, who teaches at the Maale Efraim pre-military academy, is the brother of the late Lt.-Col. Emanuel Moreno, who fell in battle during the 2006 Lebanon War while serving in one of the IDF’s most elite units, Sayeret Matkal, on a mission near B’albek. The details of that mission were so secret that due to the constraints of national security, to this day a photo of the deceased has not been published as is customary when a soldier falls in battle. Emanuel Moreno was survived by his wife, Maya and three children. All four of his brothers, including Moshe, served in elite IDF units. According to journalist Aaron Klein, highly placed sources in both Fatah and its affiliate group, the Al-Aqsa Martyrs Brigades, Al-Namir is a renegade Fatah group that opposes the opening of talks with Israel. The sources denied the group was coordinating its movements with the political leadership of Fatah and the PA, adding that it had planned and carried out Wednesday night’s attack with Hamas and the Islamic Jihad terror group. By Thursday morning, Hamas had also claimed responsibility for the attack. Prime Minister Binyamin Netanyahu, who is currently in Washington, was updated on the terror attack as he was making his way from the White House back to his hotel. Both Netanyahu and PA President Mahmoud Abbas condemned the attack. Speaking during a special dinner in Washington to mark the end of the Ramadan fast day, Abbas said: "We do not want bloodshed on the Israeli side. We want the two peoples to live an ordinary life with real peace." Netanyahu also condemned the attack and said to Abbas: "You are my partner for peace. Peace begins with leaders." This attack comes just over 24 hours after Tuesday's terror attack near Kiryat Arba, in which four people were killed, including parents of six children. MK Dr. Michael Ben-Ari (National Union) responded to Wednesday's attack and said: "Netanyahu is behaving like a UFO and not like a Prime Minister. The country is burning, the roads have become terror stricken, and Netanyahu is playing games in the United States. Netanyahu speaks of peace but brings terrorism upon us." MK Prof. Aryeh Eldad (National Union) blamed Defense Minister Ehud Barak for the attack: "The Defense Minister is responsible for the safety of the residents, and despite our repeated warnings he decided to abandon the lives of Jews and remove the checkpoints. "This lawlessness is what allows murderers to move freely and we will claim their blood from Ehud Barak," added Eldad. "The Defense Minister should resign or be fired since he has proven to be a complete failure and that he exercises bad judgment." Nachi Eyal, General Manager of the Legal Forum for the Land of Israel, said in response to the terror attack that the barriers in the region should be returned. "We've warned in the past and even appealed to the High Court against dismantling the checkpoint in the area," said Eyal. "The political echelon, the IDF commanders, and the High Court justices refused to adhere to our request and now it turns out that we were right. Are more deaths and injuries required in order to understand that the checkpoint must be returned?"